Share Sweet's "Chocolate Monster French Toast"
A small letter board on the back wall of Share Sweet (9628 Olive Boulevard, Olivette; 314-279-1350) urges you to “Try something amazing.” There’s a good chance you’ll feel like you’ve done just that after sampling some of the Asian desserts and sweet teas served at this cheerful spot. 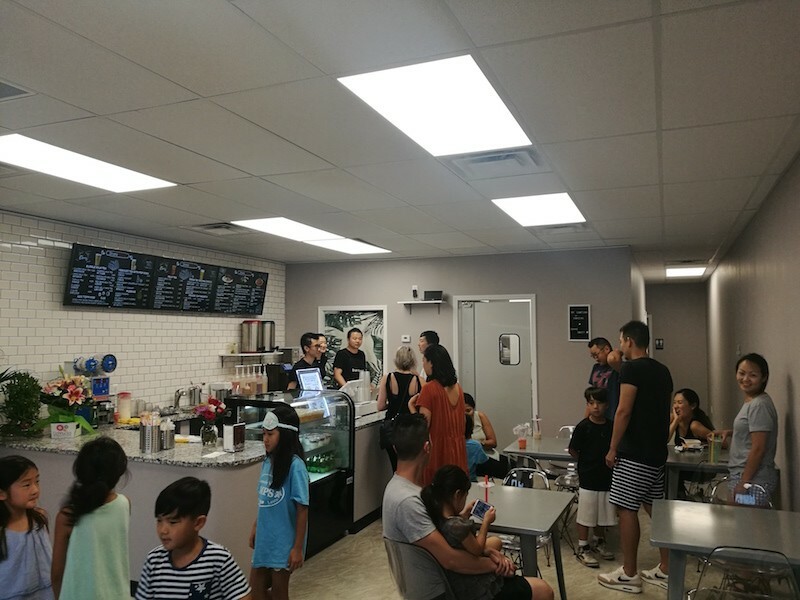 Located in an Olivette strip mall, Share Sweet opened its doors August 3. It's owned by Shanghai-born Horace Tang and Jennifer Chen. The pair also own popular Chinese restaurant Tang Palace, which is just a few miles east on Olive Boulevard from the new shop. 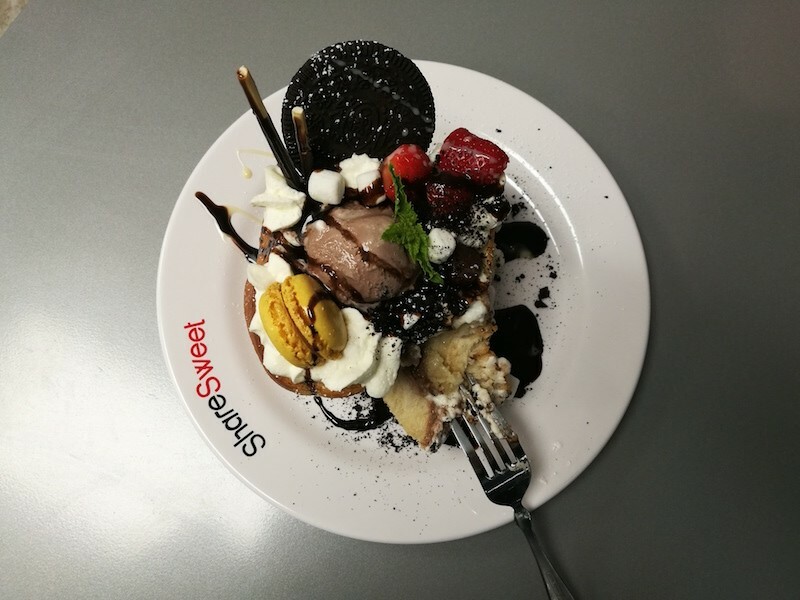 Share Sweet is designed neatly and practically, with attention focused on the counter, where a fridge displays assorted fruit puddings and staff members shuffle around each other preparing drinks. There are a handful of tables, inviting you to stay – and some of the desserts demand that you sit down — but a good number of customers are here simply to grab takeout teas. 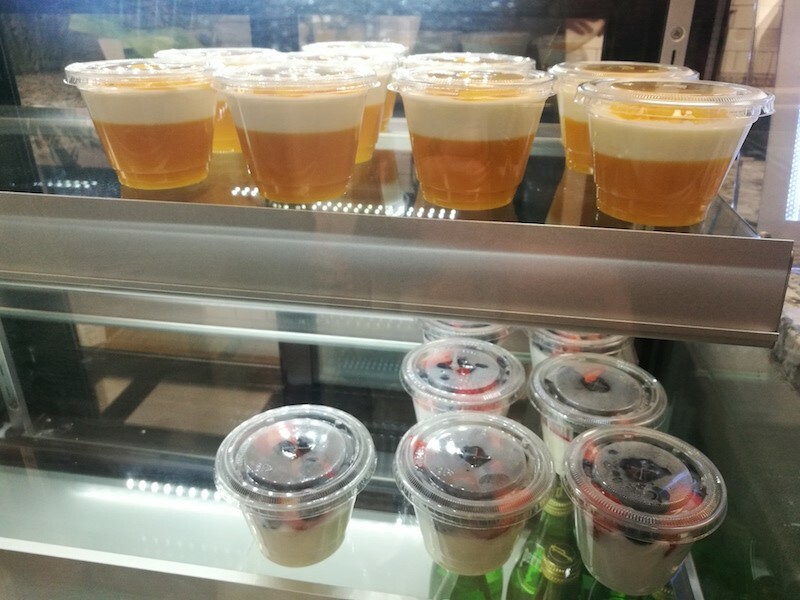 Among the to-go items on offer are mango pudding (top) and mixed berry milky pudding. The drink list is separated into four types of tea: bubble milk tea, yogurt tea, fruit tea and cream tea. Yogurt teas are $4.50 and everything else is $4.25, so ordering is just a matter of choosing the right flavor. And there are a lot of options, so take your time. Look to the cream teas, and you’ll see a choice between “original” and “cheese.” Order the cheese and prepare for a pleasant surprise. 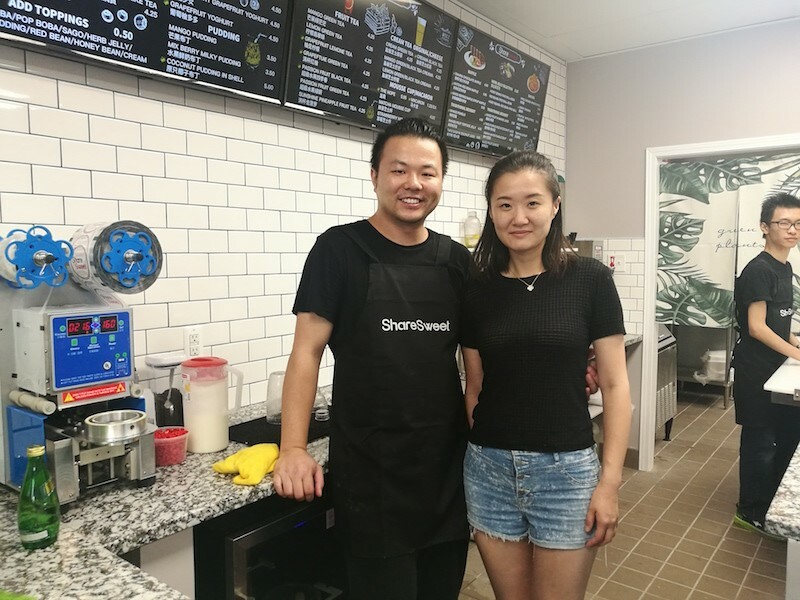 Share Sweet might be the only place in St. Louis where you can find cheese tea, a craze that has swept East Asia in the past few years. Unlike the people of Beijing and Shanghai, you won’t need to wait in line for hours at Share Sweet just to get your hands on this delicacy. The “cheese” is a two centimeter-thick layer of cream cheese (some shops use whipped cream instead) on top of a cup of cold tea. It sounds incongruous, but the effect of the cheese is actually comparable to having whipped cream atop your favorite coffee-based drink. The contrasting textures are interesting and the flavors change as the cheese slowly melts and mixes with the tea. We tried the mango green tea, and found the slight bitterness of the green tea was tempered well by the sweetness of both mango and cheese. 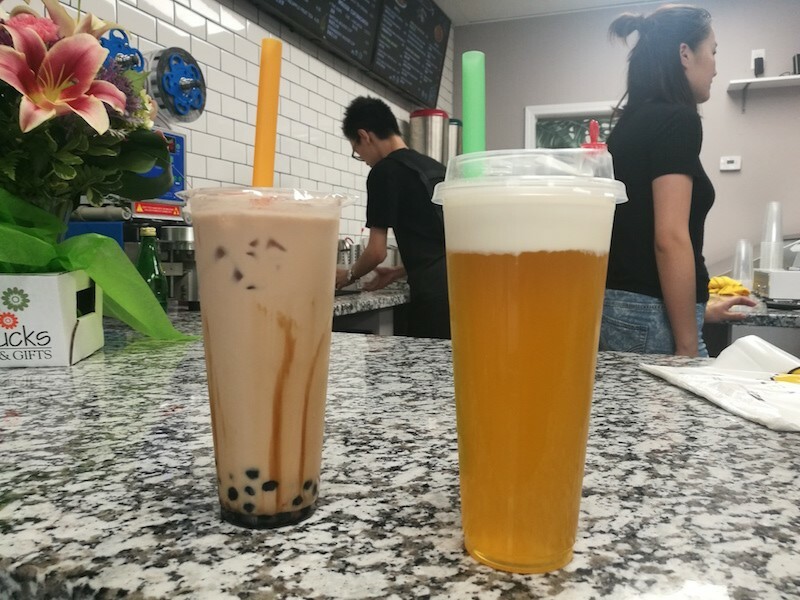 Classic milk tea with boba (left) and mango green tea with cheese. There’s also how-do-you-eat-yours fun to be had experimenting with different ways of drinking cheese tea. Do you start with sucking some of the cheese through the straw, then plunge into the tea? Or the reverse? You should try all of that, and don’t forget to sample your tea by removing the lid and at least momentarily dispensing with the straw (they’re going out of fashion anyway). Sip through the layer of cheese into your tea and do your best to avoid the cheese tea version of a milk mustache. The classic milk tea is what a good bubble tea should be, rich and slightly malty, sweet but not cloying. Most importantly, the boba, or tapioca balls, are fun to chew on and to roll around your mouth with the silky, ice-cold tea. They’re mostly there for texture, but there’s a hint of brown sugar if you’re patient enough to dissect a pearl or two carefully between your tongue and teeth. If you want more excitement in your bubble tea, there are milk teas in a variety of flavors including Oreo, pudding, chocolate, red bean and herb jelly. For 50 cents per topping, you can accessorize your drink with add-ons including popping boba, sago, honey bean and cream. 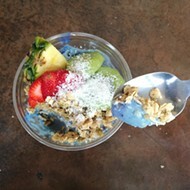 The yogurt teas all feature popping boba, releasing a splash of fruit juice when you pierce the skin. These come in four fruit flavors: mango, lemon, strawberry grapefruit and passion fruit. Or you might just go all in on a fruit tea, featuring fresh chunks of pineapple, grapefruit and passion fruit mixed with green or black tea. Horace Tang and Jennifer Chen. 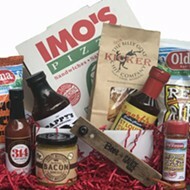 “Horace and I love to travel and try new food, and we want to bring new things to St. Louis," says Jennifer Chen. "We’ve had a really good response from customers so far. Our fruit teas are really popular. I think people are paying more attention to their health now than in the past, which is why we wanted to offer tea with fresh fruit in it. The honey toast is so popular too. I tried it in Shanghai and Taiwan, I really loved it and it looks great too." Share Sweet does serve a limited menu of savory snacks, including chicken wings, fries and fried calamari, but the main focus is on desserts. Familiar dessert flavors found throughout East Asia — red beans, taro balls, mango, coconut, matcha — make appearances in herbal jellies, sago puddings and mousses. There are also waffles, for a more Western alternative. It’ll be more fun if you order two or three desserts to share, so bring a group if you can. Be sure to have one of the stuffed French toast desserts, inspired by the “brick” toasts perfected by the dessert shops of Taiwan and Japan. These can be split between two gluttonous diners, but are better shared between three or four. The "Chocolate Monster French Toast" ($11.95) is a hollowed-out loaf filled with chocolate ice cream, cubes of toast, whipped cream, a macaron, strawberries, marshmallow, a rich chocolate sauce, an Oreo-style cookie and a sprig of mint. It’s impossible not to enjoy tearing away at the walls of the toast and stabbing with your fork at whatever sweet morsels remain. It’s huge, and yet before you know it, it’s gone. Share Sweet is open from 11 a.m. to 9.30 p.m. Monday to Thursday, from 11 a.m. to 10 p.m. on Friday and Saturday, and 11 a.m. to 9 p.m. on Sunday. The staff works to keep customers fed. Editor's note: A previous version of this story provided the wrong location for Tang Palace. It's a few miles east, not across the street. We regret the error.